These days trade union elections are fought also on social media. This includes the UNISON General Secretary election, where three of the candidates have a significant presence on twitter. John Burgess has more than 1,000 followers. Dave Prentis has a little over 900 followers. It has been alleged that whoever is running Dave’s twitter account has “purchased” followers in a desperate attempt to keep up with his key rank and file leftwing challenger. When I heard this allegation I could not believe it so I looked at Dave’s followers. Here is one of them. Here is another. And another. And another. Those four followers do strike me as being among the many of his followers of whom one might say it is a little odd that they have spontaneously chosen to follow the twitter feed of a candidate in our General Secretary election. If the allegations that Dave Prentis (or whoever runs his twitter feed) has purchased twitter followers are entirely without foundation then I am sure I shall receive four reasoned responses. And when I do, I shall blog about it. I took a detour on my way to work this morning to stand in solidarity with Sandy Nicoll, UNISON Branch Secretary at the School of African and Oriental Studies (SOAS), and with the workers at SOAS who have walked out in protest at Sandy's unjustified suspension by the employer. Sandy, who represents UNISON members across London on the Higher Education Service Group Executive, is an effective branch activist who has played a key role in campaigning for the rights of outsourced workers. The SOAS UNISON branch has played an exemplary campaigning role alongside the lecturers' UCU union and students. Most recently, this Tuesday, Sandy supported a solidarity protest to express support for students occupying the College in protest at cuts proposals‎ and bullying management. Yesterday afternoon he was suspended from work. This gross provocation from management has been met this morning with an appropriate response as workers have walked out of work to join the growing protest outside the main building. Management don't have to give notice, or organise ballots before they act - and if they abuse that power then sometimes workers need to react promptly and with determination. I hope that voices of sanity are heard within SOAS and that management reinstate Sandy and work with, rather than against, the vibrant, creative and resourceful SOAS community. The entire trade union and labour movement must stand firm against the victimisation of Sandy Nicoll. Rank and file candidate John Burgess is mounting the most serious left wing candidacy for General Secretary in the history of UNISON. A serious campaign needs serious resources - so follow the link above to make a donation! Whilst our attention is rightly taken up with the pernicious Trade Union Bill going through the House of Commons, it is worth remembering the exit payment cap which the Tories are seeking to impose upon public sector workers as part of the Enterprise Bill, currently before the House of Lords. As the link above, former leading UNISON activist, Rita (now Baroness) Donaghy is leading opposition to the relevant clause of the Bill (Clause 26). The exit payment cap will hit not only senior managers but also - for example - career local government officers who have reached Principal Officer grades and are made redundant in their mid 50s‎. Yesterday, in the tenth and final sitting of the Committee stage of the Trade Union Bill in the House of Commons, the new clause seeking to eliminate “check-off” arrangements for the payment of unions subscriptions was formally added to the various other vicious proposals to obstruct strike action, neutralise trade union political campaigning and generally hobble our movement. Interestingly, the Minister suggested that, whereas trade unions are going to be given only three months to get each member currently paying the political levy to sign a consent form to be able to continue paying, we will have a generous (?) six months in which to transfer members who pay their subscriptions from their wages or salaries on to direct debit. The Bill will now proceed to its third reading in the House of Commons after which it will have to be considered in the House of Lords before receiving Royal Assent. Whilst we must now focus our attention on lobbying against the Bill, we need also to give serious thought to how we will handle both the massive administrative tasks which the enactment of this vile legislation would set before us. One of our sister unions (or as officials sometimes say “competitor unions”) has already launched a mobile app with a facility to switch members to Direct Debit payment of subscriptions. While the Today Programme is explaining statutory instruments and a Tory Government is finding out what it's like not to have a majority in the Lords, those of us preparing for Monday's lobby of Parliament should be paying attention to another aspect of our (unwritten) constitution. The (Anti) Trade Union Bill is at Committee stage in the House of Commons. This is what happens between the second reading of a Bill (when the Commons has its first significant vote on the principle of some primary legislation) and the third reading (which concludes the passage of a Bill through the House). In Committee a small group of Members of Parliament, allocated by the whips in proportion to the weight of each Party in the Commons, scrutinise the Bill "line by line" and consider amendments. It's worth visiting the website to see how the debate has been going in this Committee - http://services.parliament.uk/bills/2015-16/tradeunion.html. A small diligent band of Labour MPs make repeated, informed comments and propose reasoned amendments, whilst eloquently condemning the Bill itself. In this they are supported by a smaller number of Scottish Nationalists. From time to time one of the majority of Conservative MPs on the Committee says something stupid, but generally, with the exception of the Minister (who intervenes to refute what has been said - and often to say that he'll get back to the Committee with an answer to a question which has him stumped) the Tories stay mostly silent and just vote down the sensible amendments. One amendment they won't vote down will be the amendment which will prohibit "relevant public bodies" from making deductions from wages or salaries in respect of trade union subscriptions (the text is in the link at the top of this blog post). Although the primary legislation will simply create a power, which individual Ministers may then use to bring regulations specifying which are "relevant public bodies " - so Royal Assent to the Act itself will not directly start the clock ticking on withdrawal of DOCAS by any particular employer (or category of employer), the existence of this power on the statute book is a dagger to the membership (and purse strings) of our movement as other proposals in the Bill threaten our rights to take both industrial and political action. Therefore, this proposed amendment is one more reason to redouble our campaigning against this pernicious Bill. No one has asked for this amendment and (on my reading of the minutes of the earlier sessions of the Committee at which witness evidence was taken) no one has made the case for it. This amendment is also, without doubt however, a clear indication that, should these powers reach the statute book we must immediately commence arrangements to ready ourselves for the shift to direct debit - including detailed pilot projects‎ and a major organising campaign modeled on the Australian experience. Prentis wins a victory over the Returning Officer. Or does he? Doughty battler for the rights of UNISON members, Dave Prentis, has won a personal victory with some new guidance for the current UNISON General Secretary election issued yesterday by the Returning Officer. Dave disagreed with the cautious interpretation of the election procedures which I had been given by the Returning Officer last week. He maintained that in previous elections branches had been able to tell members not only whom they had nominated but also why. Having made a promise to a new reader of this blog over the weekend, I hereby congratulate Dave on securing this new and more liberal interpretation of the election procedures. As the candidate with the most branch nominations, our incumbent General Secretary will be pleased with this outcome. The real advantage is almost certainly to challenger candidates who don’t have their photo seven times on the first nine pages of this month’s UNISON Focus (up from four last month), nor their own column, nor their name as the first word of the first headline. An incumbent General Secretary seeking re-election can (quite legitimately) promote himself daily simply by doing his job. He doesn’t need the 100 words which branches can now use to explain why they nominated him. Other candidates who don’t benefit from such serendipitous coverage in the official publications of our trade union stand to gain more from the ability of branches to explain to members the reason for their nomination. In any event, whilst the current General Secretary has amassed more nominations than the combined total for his challengers the application of some historical perspective is instructive. Last time round Dave was nominated by 371 branches, 11 regional councils, 7 Service Group Executives and the National Executive Council. This time Dave has no more than 230 branch nominations (18 of which may be ruled out) 8 Regional Councils and 5 Service Group Executives. The 40% fall in branch nominations is most striking, but to those with inside knowledge of our union the fact that an incumbent General Secretary cannot secure nominations from some of our Regional Councils and Service Groups upon which he could previously rely speaks volumes about the growing realisation of the need for change. I’ll have to go now as I have to compose 100 words in support of the change candidate John Burgess. 11. Don't forget we oppose the cuts! Cuts in local government expenditure are caused by decisions of (Tory) Central Government. Everything we do or say should remind people of this. A vital part of what we do must be to mobilise public opposition to cuts (even where these are being implemented by Labour administrations). Labour Councils should be making clear that they do not want to implement Tory cuts. Therefore Labour inspired demonstrations against cuts will be demonstrations, most of all, against Tory cuts (even where they are being implemented by Labour administrations). Labour Councillors should be prepared to mobilise against all cuts, including those for which they may have voted. Labour Councillors (whether in opposition or in “power”) must recognise that Council officers have an agenda around “prudence” and a “balanced budget” and that the conclusions which they draw can be challenged. Each local authority has a level of reserves which reflects a political choice. The allocation of expenditure between revenue funding, capital funding, Housing Revenue Account (HRA) funding and grant funding also reflects political choices. Diligent Labour Councillors will not accept that their authority must make the particular level of cuts which they are told must be made. Even given a particular “global” target for cuts in a particular authority it does not follow that each particular proposed cut must be made. Labour Councillors in office should engage Labour Party members in a decision-making process about where cuts should fall (which should encompass the full range of options including a referendum to increase the Council Tax). Even if Labour Councillors will not “take on” the Government by refusing to make cuts it does not follow that they must support each particular proposed cut. The most important function of local Labour politicians is not that they should be prudent custodians of the resources of the local state, it is that they should be community leaders. Therefore Labour Party representatives should be at the head of each and every campaign against cuts in public services (even where those cuts are being proposed by Labour local authorities). Labour representatives should represent the interests of working class electors, whose interests are that cuts should not be made. The left (Corbyn-supporters) within the Party are strong because of our numbers within the rank and file, not because of the positions we hold in the formal structures of the Party. Whilst we must pay close attention to the formal structures (timetables for election etc.) we must also initiate activity outside the formal structures of the Party which can be expected to gain official support. For example, in many Constituency Labour Parties we need to call for demonstrations against local authority cuts ahead of irrevocable decisions by the local authorities (which may be Labour controlled) to make those cuts. Whilst official Labour Party bodies would not initiate such protests the majority of members will expect the Party to do this. We can therefore call for such protest in a way which supports and compels the Party also to protest. It is the trade unions who generally hold the feet of the employer to the fire around the regrettable tendency for Councillors to believe assurances from senior officers about equality (and the TUPE Regulations). Consistent opponents of cuts in local public spending will welcome (for example) reductions in expenditure on the use of agency workers, without illusions in the consequences of their disappearance. Socialists in the Labour Party need to engage with and understand the detail of local authority budgets. ‎To some the name Roger Bannister means the four minute mile. To others it means the perennial candidate for General Secretary of UNISON, who knows he can do well but that he will never win. And he's still at it. Although Roger Bannister barely scraped the twenty five branch nominations which are required to make it on to the ballot paper for the current election for UNISON General Secretary he remains driven by the awesome self-regard which has persistently led him to assert that he would only stand aside for a candidate whom he (himself) considered better. (unless he never meant that and was just doing as he was told by the associates of his "party"'s "leader", a Mr Taafe). As a candidate, Roger certainly has the advantage of name recognition, most of all among those of us who have been around for a while. Roger stood in the last ever General Secretary election of the largest of the "former partner unions" (NALGO) coming a close third. He came third once more in the first election for General Secretary of UNISON, behind victor Rodney Bickerstaffe and right wing candidate Peter Hunter. In 2000 Roger came second to Dave Prentis with 71,021 votes (32%). Five years later he came second again with 41,406 votes (17%). Last time round Roger once again came second, this time with 42,651 votes (20%) (of a lower turnout). Every time Roger has faced Dave Prentis in an election there has been another left candidate who has (from the perspective of Roger and his supporters) "split the vote" - but each time Prentis has won an absolute majority. (Your humble blogger has the distinction of having been the least successful of those other candidates). As a critical observer of UNISON over many years, your blogger has also been able to observe and understand what has been going on. Roger Bannister represents a "safe" "loyal opposition" to the UNISON machine (which is why the anonymous Prentis-supporting blog which spat bile at John Burgess and Heather Wakefield ignored Roger). On the one occasion - in 2000 - when Prentis supporters feared Roger as an electoral adversary he was the subject of scurrilous personal attacks.‎ This hasn't been repeated in future elections - and not just because Roger is the polite and courteous face of the left on the National Executive Council (NEC). (In my twelve years on our NEC I have often noted Roger's quiet and conciliatory approach). UNISON officialdom are as comfortable as the leadership of the Socialist Party with periodic jousting matches in which Dave remains General Secretary by virtue of his control of the machine and Roger remains the "left challenger" because people remember who he is from last time. The Socialist Party share with Progress supporters within the Labour Party a determined refusal to accept that the Labour Party has changed. They continue to argue that socialists should leave the Labour Party and join their tiny organisation. The application of these politics within UNISON leads them to believe that they should stand a "Socialist Party" candidate for General Secretary, hoping only that their candidate will, once more, be the most successful loser so that they shall be seen as "leading" the left. This election has been different because Roger (realising his very limited support) initiated a dialogue with the other "not Prentis" candidates (genuine rank and file challenger John Burgess and "dissident" official Heather Wakefield) about having a single challenger to the incumbent General Secretary. This initiative from Roger was driven purely by the anticipated presence on the ballot paper of an "official" who is not Dave Prentis.‎ Roger's co-thinkers in the Socialist Party showed a similar obsession when they tried (unsuccessfully) to discourage Mark Serwotka from running for General Secretary of our sister union, PCS - urging at that point support for Hugh Lanning. Lacking (quite reasonably) any genuine confidence in the one dimensional politics of their risible "organisation", Socialist Party activists in the trade unions‎ are particularly vulnerable to the delusion that "splits within the bureaucracy" can determine the future of our movement. (Those afflicted with an affection for the similarly comical "Socialist Workers Party" have different, but equally problematic delusions). It is the personal misfortune of Roger Bannister in UNISON that he is compelled to live out the vicarious political fantasies of his most "party-minded" comrades. It is the collective misfortune of UNISON's rank and file activists that our comrades who are members of that Party put the interests of their small clique ahead of the general interests of our class. Roger Bannister will remain on the ballot paper only should his candidature bring with it the unique luck of having had not one of his 25 nominations disqualified.‎ Since the numbers of nominations disqualified for each of the other challengers are in double figures such luck would be remarkable - but given the convenience of such an outcome for the powers that be it cannot be ruled out. ‎Your blogger shares with Roger Bannister the weariness which comes from years of resisting unimaginable carnage. Roger has what may turn out to have been a last opportunity to make good out of his reputation by supporting the credible rank and file challenge from John Burgess (who has offered Roger a leading role in his campaign). Those activists in the Socialist Party who remember when their political tradition (then known as the "Militant Tendency") amounted to something should understand why they should support John Burgess. Just like Dave Prentis, Roger Bannister has been cajoled into standing for election as General Secretary. UNISON members need not collude with this unreasonable pressure on either of those perennial candidates. It's time for the future. Prentis listens and corrects error. Better late than never. 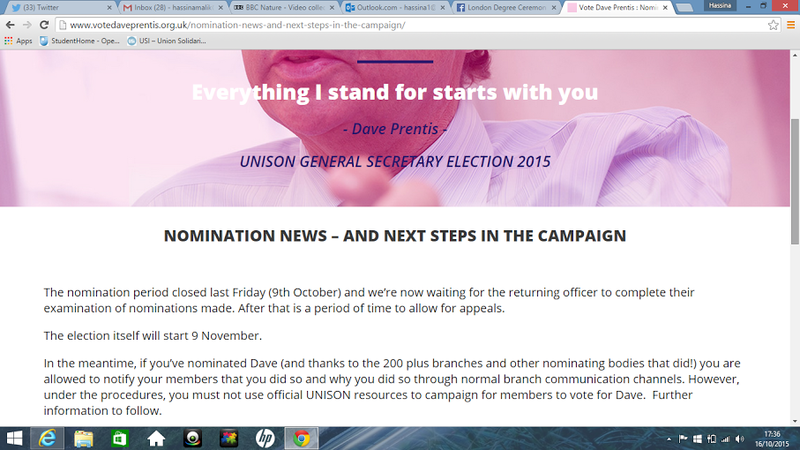 The link above reveals that the wording of a blog post on the campaign website of Dave Prentis, originally posted dated three days ago has been amended today‎ to correct misinformation about UNISON's election procedures. For those with an almost obsessive interest in trade union democracy and a concern for the affairs of UNISON which borders on a personality disorder, the full background is in the previous post on this blog. One cheer to Dave for correcting an error which (since he has been in charge of our Union for the past fifteen years) he should not have made. Sadly the other two cheers have to be held back. The apology which Dave should be making to his supporters for misinforming them isn't online yet - perhaps it is still being drafted? And - of course - it is very poor "netiquette" to amend an inaccurate blog post so that future readers do not know you made the error in the first place. Still, as the three companies project teaches us, some people have a difficulty admitting even their most embarrassing mistakes. The Returning officer has issued revised guidance, which I will cover in a further post. “The nomination period closed last Friday (9th October) and we’re now waiting for the returning officer to complete their examination of nominations made. After that is a period of time to allow for appeals. The election itself will start 9 November. When I read this I was struck by the very liberal interpretation of our election procedures being adopted on behalf of a candidate who is already our General Secretary. In past elections it has been permissible to inform members of a branch nomination but not to go into the reasons for the nomination – as that would amount to using UNISON resources to campaign for that candidate. “I am writing, as a UNISON Branch Secretary, to seek guidance on the correct interpretation of paragraph 51(a) of the procedure for the General Secretary election, having become aware of a liberal interpretation of the provisions of that paragraph which has been published by one of the candidates (who is the incumbent General Secretary). Paragraph 51 of the procedure provides inter alia that UNISON “funds, property or resources cannot be used to support campaigning for any particular candidate, except in the following circumstances. This has commonly been interpreted as meaning that (for example) a UNISON branch can inform its members of the fact of the nomination which it has been made without calling openly for a vote for that candidate. 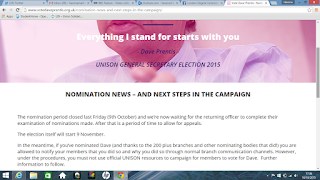 However one of the candidates in the current election (the incumbent) has published online the following interpretation “if you’ve nominated Dave you are allowed to notify your members that you did so and why you did so through normal branch communication channels”( http://www.votedaveprentis.org.uk/nomination-news-and-next-steps-in-the-campaign/). I have added the emphasis to the words which make this a liberal interpretation of paragraph 51(a). I am writing both to the Returning Officer and to the Union in the hope of some urgent guidance. Can you please confirm that it is in order for branches to notify their members both of the fact of the nomination which they have made and of their reasons for having made that nomination and that this will comply with paragraph 51(a). “I acknowledge receipt of your email dated 16th October. I am pleased to have had such clarification (which happens to reflect the approach of the campaign of the candidate I support – the serious rank and file challenger John Burgess). It is worrying that the Prentis camp have not been as careful and have misinformed their own supporters in a way which could call the result of the election into question if Dave were to win. I hope they will correct the blog post and issue an apology – but will post a screen shot of the page for posterity. Do we want to re-elect a General Secretary who is so unwilling to engage in detail that he can't be bothered with the detail of the election procedure for his own job? UNISON refusing to face the future?